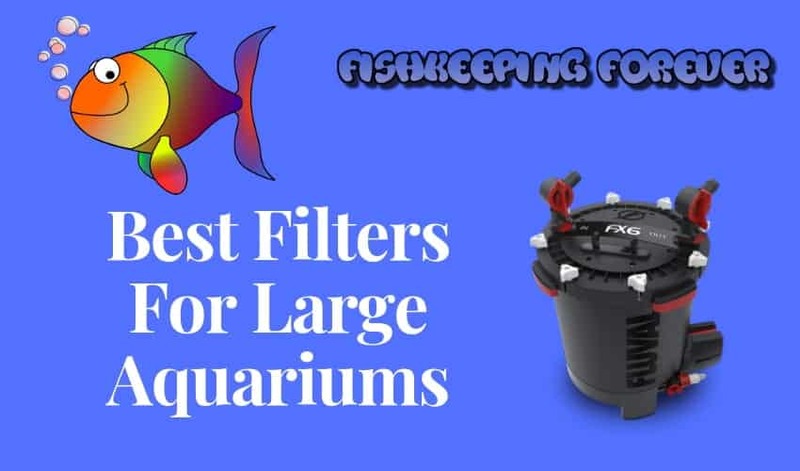 BEST FILTERS FOR LARGE AQUARIUMS - TOP 7 REVIEWED! Blog BEST FILTERS FOR LARGE AQUARIUMS - TOP 7 REVIEWED! We all know that when it comes to setting up an aquarium, one of the most important – if not the most important pieces of equipment – is the filter. This is not only because using a filter saves us time on maintenance (meaning it’s needed less often), but also to keep the water free of toxins, clean and maintain a suitable environment for our chosen fish. Although there are many types of filters available such as HOB, sponge and under gravel, the best filter for a large aquarium is undoubtedly the canister filter. These have usually been designed with the larger aquarium in mind and have all the features and capabilities that they need. If you have a smaller aquarium and are looking for a suitable filter, then you may be better reading our BEST FILTERS FOR SMALL AQUARIUM guide. 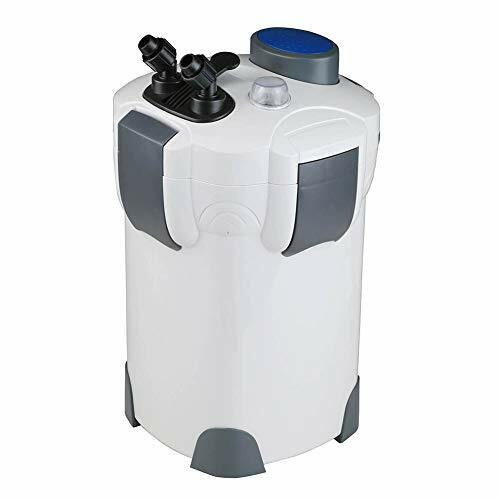 The Fluval external is suitable for tanks of up to 70 gallons and has a powerful motor, capable of maintaining a strong flow in between aquarium cleans. It is quiet and has a precisely engineered bearing that minimizes impeller vibration. The filtration that the Fluval External provides is three-stage; chemical, mechanical and biological. There is also no need for siphoning as this filter has instant prime. Due to the aqua-stop valves of the Fluval External, there are no leaks or mess during maintenance either! There has been a previous version of this filter and, unlike in some cases where the new version really doesn’t better the old, this one really does. With a 10% increase of the flow in this newer version, it has also been modified to be easier to use and clean. Overall the new Fluval External filter is just all around better. On a less positive note, the tube length could be longer and the initial set up could be simpler. However, these are only slight niggles and should not deter you from buying one of these. Flow Rate 525 GPH (2000L/hr). This canister filter is equipped with a built-in 9 watt UV sterilizer that controls algae spores and bacteria, helping to keep your water cleaner and healthier. It is suitable for aquariums up to 200 gallons and can turn over 525 gallons of water per hour. Standing at 19 inches, the Polar Aurora is suitable for fitting under most aquariums and comes with an incredible four media trays, adjustable spray bar, and self-priming pump. This eliminates the need for siphoning during maintenance and reduces the difficulty of getting the filter back up and running afterward. 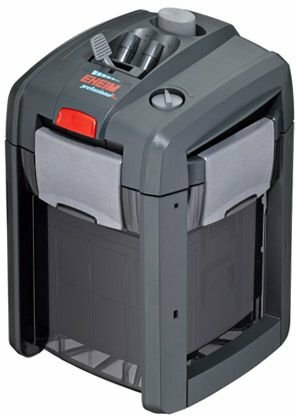 The overall performance of this canister filter is great, especially considering the low price that it is available at. There are, however, some slight niggles including the pipes not being particularly flexible and it not being designed for easy movement during maintenance. The Fluval Advanced Filtration System offers all the benefits you expect from a Fluval canister filter and more. It has power, long-term reliability, emits no noise and provides high performance for tanks up to 160 gallons. The water volume it turns over is 265 gallons per hour. 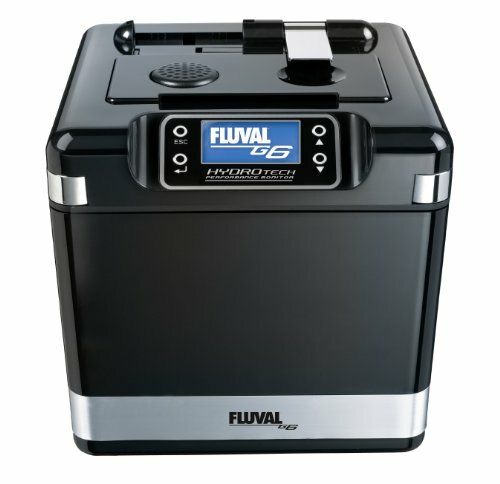 Unlike other canister filters however, the Fluval Advanced has the added benefit of Hydrotech; an intelligent monitoring system unique to Fluval. This can store and communicate to the user real-time filter performance, water parameters and cleaning schedules along with aquarium temperatures and conductivity. All this information is displayed on a screen located on the filter’s casing. On the downside, the pipes are opaque on this canister filter, which makes it difficult to clean them thoroughly as you can’t see inside. The outer casing is also easily marked and scratched meaning it won’t look pristine for long. These however, are very minor setbacks with this filter and not something that should prevent you from purchasing it. 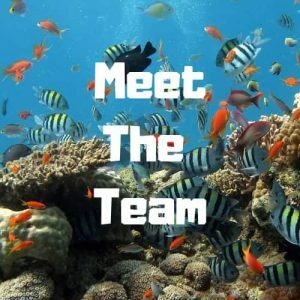 Fluval has to be one of the most recognizable and respected names in the world of aquatics and with good reason. Put simply they make high quality and high-performance products that you can rely on, with the Fluval FX6 being no exception. 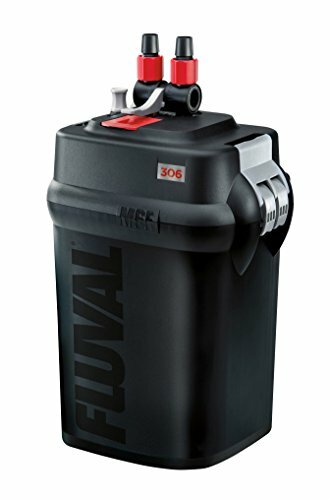 A multi storage filter that can be used with both marine and freshwater tanks, the Fluval FX6 uses smart pump technology for ultimate filter performance. It is self-starting – just add water, plug in and go – it also has a monthly maintenance reminder built in. This is handy for those out there like me, who have multiple aquariums and cannot always keep track of exactly when each was last cleaned. Fluval state that this filter can pump at 563 gallons per hour making it suitable for tanks up to 400 gallons. Remembering the guideline of turning your aquarium’s water over four times an hour, however, it may need additional help or be more suited to smaller aquariums. 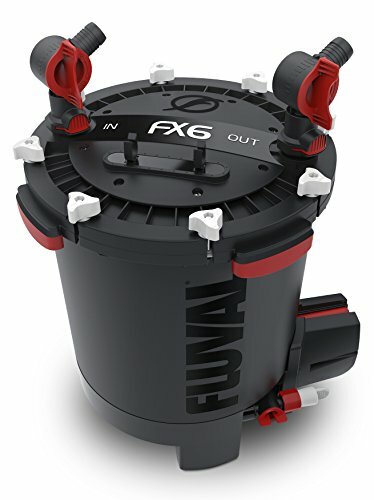 Function wise the Fluval FX6 has a multi-directional output nozzle, aqua-stop valves for easy maintenance and an electronic circuit board that monitors the impeller’s speed and pump power. It is also exceedingly quiet and at 21 inch high, fits underneath most aquariums. On a less positive note, the Fluval FX6 does not come with all the media needed to fill this canister filter so there will be an extra expense purchasing the extras needed. Described as a complete ECO-system in a box, the Hydor Professional 450 not only delivers high performance, it is also designed to make the most of the space under your aquarium. Depending on how high the flow rate is set, this filter can move 75-125 gallons per hour of water through your aquarium. A solid and well-constructed filter, the Hydor Professional 450 is easy to set up, maintain and use. It comes with everything you could need and more – including a unique ‘no bypass’ design which ensures that water always passes through the filtration media. To ensure powerful filtration, the Hydor Professional 450 comes with extra wide tubing that allows increased water flow, and ball valves to control the level of flow. An expandable spray bar is another great feature of this filter which helps you to adjust water flow to the perfect level. On the downside, as this filter is fairly new, replacement parts can be difficult if not impossible to source. It is also not the easiest canister filter to perform water maintenance with as there tend to be leaks and spills. Suitable for tanks up to 60 gallons and with the capability to pump approximately 200 gallons per hour around your aquarium the Jebao 503 has to come close to, if not top, in this list of best filters for large aquariums. Don’t get me wrong it is not entirely perfect but for the money you pay, it is pretty close. 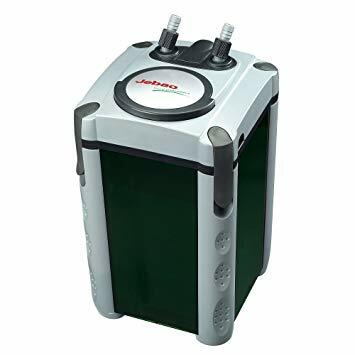 Easy to set up and with multistage filtration over three baskets, the Jebao 503 is easy to prime, has 360° hose connection turning, and a really good flow rate. It also has rubber stands underneath to heighten optimal vibration damping. It is suitable for both marine and freshwater aquariums. On a less positive note the Jebao 503 does not include the charcoal, bio balls or ceramic rings that are needed to run this filter, they will need to be purchased separately. It also is not as quiet as it claims to be. Dimensions 10" x 10" x 14"
The Eheim Pro 4+ replaces the Pro 3 range and is suitable for aquariums up to 65 gallons. It has a flow rate which is adjustable, a self-priming button, three-stage filtration and an additional control function, the Xtender. This clever little design counteracts blocked filter media and extends the time between maintenance. From a positive point of view, the Eheim Pro 4+ is incredibly quiet, which is always a plus as no one likes to hear the ‘humming’ vibrations of a filter at work. It also involves no work when it comes to filling and restarting as it has a self-priming button. It is also easy to clean and comes with all the media, filter pads and installation products you need. On the downside, the Eheim Pro 4+s adjustable flow rate is not exactly precise. Turning the flow up a notch and then back down one, does not seem to result in the original flow rate. This, however, isn’t the hugest of problems as playing around with it a little will ensure you get it right. Be aware also that when draining this canister filter, not all water will be removed from the media baskets and some may remain leading to splashes and spillages. 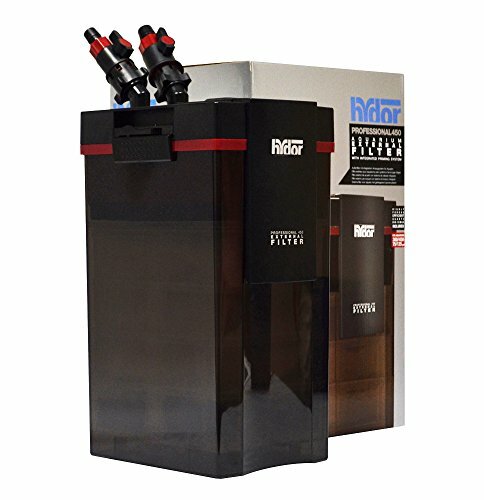 There are many factors you should consider when buying a filter for a large tank. The obvious ones are price, capability, and size. Often brand awareness also comes into play. If you were given the choice of choosing a free filter would you choose a Fluval or a Jebao? Many new manufacturers are now coming into play and competing with the bigger more well-known brands, and to be fair they are starting to bridge the quality gap. Whichever filter you choose, ensure it will fit your needs. The Gallons Per Hour rating (GPH) is one of the most important things you should consider. It doesn’t matter what the filter looks like, or the price, if it can’t cope with the water volume within your tank then it’s worthless. We hope we’ve helped you to make the right choice when purchasing a filter for larger aquariums. If you have a smaller aquarium, let’s say 75 Gallons or less then have a look at our review of the Best filters for small fish tanks.